Homepage. This page: A look at a small-volume motor club magazine from the Scottish Sporting Car Club. The original Top Gear motoring magazine. Most of the motoring magazines from yesteryear already mentioned on oldclassiccar are high-volume, national (or in some cases international) publications, with a readership numbering in the thousands. Time now for a motor club magazine, dating to 1951, which would I suspect have had a print run of hundreds rather than thousands. The magazine is Top Gear, a name now associated solely with the BBC programme of the same name, a programme where three grown men thrash exotic modern motorcars, and rid the world of damp-ridden old caravans. This magazine though was essential reading for both active and armchair Scottish Sporting Car Club (SSCC) members north of the border. The club was one of the supporting organisations behind the Bo'ness hillclimb, amongst others. This particular issue is Volume 3, Number 1 (May 1951). The cover price was one shilling (5p), and inside is referred to as "Scotland's Motoring Bi-monthly" so whether it was also sold to Joe McPublic I'm not sure. In all it runs to 36 pages, mostly printed in black and white with a dash of green on both outer covers, and in the JP 500 advertisement inside. Top Gear - motoring bi-monthly. Whereas many car club magazines are lightweight affairs, with perhaps just a few typewritten pages of event results, the Top Gear mag has a quality feel to it, and features both articles and interesting old advertisements in good supply. The cover of the mag shows spectators watching a car taking part in the "Scissor's Test" in Strathpeffer Square. The car, which looks like a 3 litre Bentley to me, is registered FX 8939. A quick search online shows that this fine vintage Bentley survives to this day, painted green. Open the pages, and there are some great old advertisements for companys such as Rossleigh Ltd (Jaguar agents), The Scottish Automobile Co. Ltd (Rootes), Frew and Company Ltd (advertising the swoopy Allard K2 sports two seater for 1951), John Gibson & Son Ltd (MG), the Glasgow Radiator Co. Ltd, and Wilson's Garage of Dunoon (Austin distributors as well as Exide battery agents). The first article of note discusses a 'special' built to compete in off-road trialling, the car being the J.C. Kennedy Wolseley Special (reg. YS 3432), based around a Wolseley 14 and built by a J. Cameron Kennedy. The old four seater bodywork was removed from the scuttle backwards, exposing the chassis so that it could be both shortened, and lightened, as much as possible while still maintaining strength and rigidity. The actual cutting and shutting of the Wolseley's chassis was undertaken by a chap called James Anderson of Newton Mearns, who would later do extra work to improve the steering of the car once it's wheelbase had been drastically reduced. A simple rear body was fashioned from 1"x1.5" ash, over which aluminium sheets were laid. The original doors were simply cut down to suit the gap between scuttle and rear body. The engine was left largely alone, although the head was skimmed to bring the compression up a little. The car proved to be very successful in the trials it was entered in, demonstrating that ingenuity rather than extremely deep pockets, would go a long way in the build of a suitable trials car. I wonder if it is still around somewhere? The next article, by David Scott-Moncrieff, sought to introduce the motoring beginner to the delights of the Bugatti marque, with illustrations showing Ernest Friderich driving a Type 13 in 1911, and a straight-eight Type 30 which could crack the ton (100mph). A Type 40 with Grand Sport coachwork, and a Type 37 G.P. 2 seater were also shown. 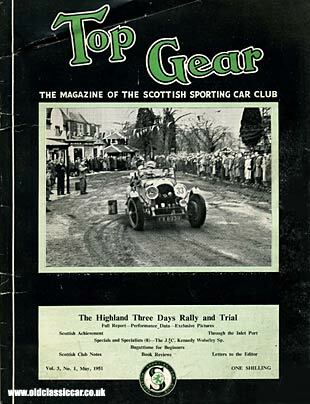 Following this, two more articles of interest to the sporting motorist - a review of Arrol-Johnston accomplishments, written by Bill Boddy, and a review of the Highland Three Days Rally and Trial, a photograph of which appeared on the Top Gear magazine's cover above. The JP Lightweight 500cc & Formula 3 racing cars. Part way through the magazine is a full page, part-colour advertisement for 'The new J.P. Racing Cars', a product it would seem of Joseph Potts Limited, North Road, Bellshill in Lanarkshire. Two models are referred to in the ad, one for the 'Lightweight' Formula 3 car, and the 'Universal' which could be specified for 500cc, 1000cc or 1100cc racing. The JP featured a light steel tubular chassis, precision rack and pinion steering, independent suspension front and rear, individual seating and controls, Lockheed hydraulic brakes, and could be purchased for £525 ex works, minus engine (usually a Norton unit). 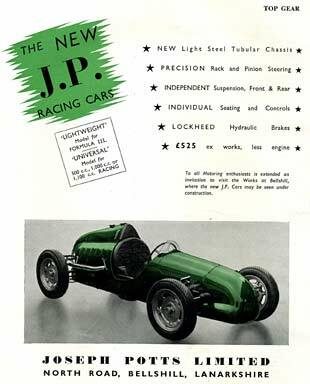 The JP was built from 1950 to 1954, very much in the style of other 500cc racing cars of the day, most notable Coopers. Curiously a search online for this company shows a company of this name still operating from North Road, but now involved in funeral arranging!? 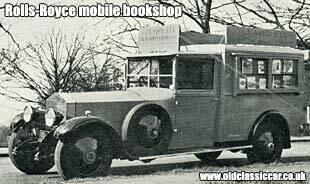 A few pages further in is a half-page article about a new mobile bookshop, from which motoring books would be sold at race meetings up and down the UK. Amazingly this coachbuilt creation was built on a Rolls-Royce chassis of very dignified air, at the request of booksellers F & E Stoneham, the idea being to attend motor races across England and do a roaring trade in motoring publications. Painted grey, and registered UU 4100, I'm sure it must have created quite a stir! does anyone remember this fabulous vehicle? P.J. Stephens, a manager with Stoneham Ltd and an author himself (I've a copy of his Ford Specials book behind me here) set to work and was responsible for this creation being born, and was the driver lined up to take this mobile bookshop on its first outing, to the Easter Monday meeting at Goodwood. Was the mobile bookshop a success? did you buy a book from it? and whatever happened to this unusual R-R?? it may well survive, as do so many Rolls-Royces of the 20s and 30s, but I'm sure that it will have been re-bodied by now. Update on this Rolls-Royce. News came over early in 2010 that this particular R-R, chassis #100KR, does indeed survive. After service as a bookshop/van, it was later turned into a hearse, and is now being re-bodied as a sedanca coupe. Results from a number of other sporting events, mainly of a trialling nature, receive a write-up in the Top Gear magazine. The final pages are given over to advertising once again, with ads from George & Jobling of Glasgow (Allard), The Scottish Automobile Co. Ltd once again (this time for Riley sales and service), SMT Edinburgh (Aston Martin distributors), John Croall & Sons Ltd (Singer agent, their ad showing the new SM 1500), plus a number of non-motoring-relating adverts. 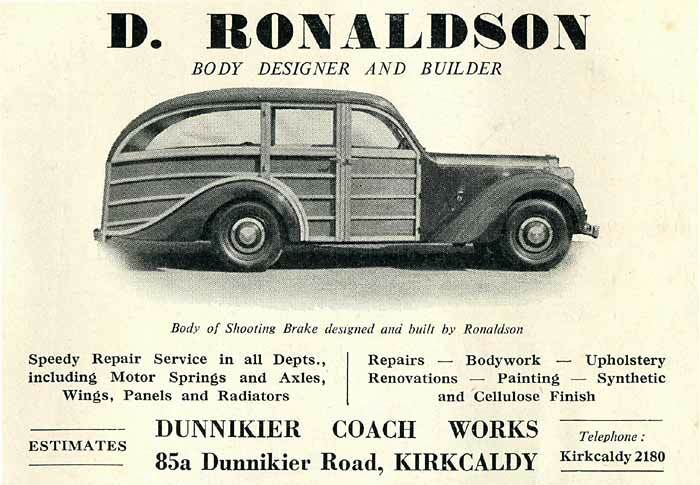 One final motoring ad that caught my eye was for D. Ronaldson, body designer and builder, of the Dunnikier Coach Works in Kirkcaldy. It shows a side-on photograph of a very fine woodie, or 'shooting break', both designed and built by Mr Ronaldson. They also offered speedy repair of motor springs, axles, wings, panels and radiators, plus upholstery renovation and paint re-finishing in both synthetic and cellulose finishes. All in all this was an excellent publication for anyone interested in motorsport activities north of the border during the postwar years. Return to the car magazines section, which amongst other titles, looks at another Scottish motoring magazine called The Motor World.